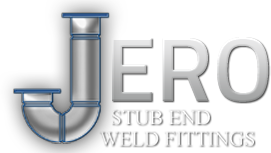 Jero is a custom manufacturer of quality stub end weld fittings in Florence, Kentucky. The company has continued to grow and introduce new manufacturing processes since inception and can provide stub ends in a variety of alloys. Jerome “Jerry” Rump started Jero Inc. as a welding & safety supplies company. Jero started the hardfacing and overlay work on weld neck flanges. Jero started manufacturing high nickel alloy stub ends. Jero started producing 300 series stainless stub ends. Jero was awarded a patent on the welding process it currently uses today. Donnie Boyers became president of Jero. Donnie Boyers purchased Jero from Jerry Rump and other silent partners. Also, in 2004 Donnie purchased the company Iron City; a Type C manufacturer out of Portland, Oregon. Jero moved from a 17,500 sq. ft. building to a 30,000 sq. ft. building. Jero is pleased to announce they are now ISO 9001:2008 certified, along with PED (Pressure Equipment Directive) certified. Jero has moved again from a 30,000 sq. ft. facility to a 90,000 sq. ft. facility. We have steadily expanded and seasoned our business over the last 34 years. Tom Fitzpatrick is currently the owner and president of Jero.